ARE ALL WATTS CREATED EQUALLY? Not all watts are created equally. How you produce wattage is the first consideration to think about when developing a time trial strategy. You can create 1,000 watts by pedalling in the 53:12 gear at a very high force but with low cadence, or you can produce 1000 watts by pedalling in the 39:21 gear at a low force but with very high cadence. The power output is the same in the end, but you utilise very different muscle fibres to produce it. Most fast-twitch (Type II) muscle fibres are recruited in a high-force, low-cadence situation, whereas more slow-twitch (Type I) fibres are recruited in a low-force high-cadence, situation. Why does this matter when it comes to getting the most out of your time trial efforts? It matters because of the energy expenditure in both situations. When fast twitch muscle fibres are recruited, more muscular glycogen is used in the contraction than when slow twitch muscle fibres are recruited. Pedalling as smoothly and steadily as possible is key in time trials. By keeping the normalised power and average power as close to each other as you can, you save valuable energy. When normalised power is very high relative to average power, this means your power has fluctuated too much. By saving your efforts on hills and avoiding bursts of wattage, you can keep your index low and therefore really maximise your energy efficiency throughout the course. When considering power output and smooth pedalling, even an effort that isn’t full gas is a ‘match’ which is already ‘burned’. This will cost you more than you want to spend. This is critical waste of muscular energy which could impact negatively later on in the race. In the same way as when you are driving a car, your fuel consumption will be much higher if you are constantly braking and accelerating hard at every opportunity, than if you just drove smoothly and consistently. Your muscles will react in the same way with energy expenditure when fluctuating between low and high power than retaining a constant, steady output. Variability index (VI): algorithm showing how smooth or evenly paced an athletes power output was during a race or work out. A properly paced time trial should have a VI value of 1.05 or less while a road race or criterium may have a VI as high as 1.1 or more. Variability Index can be calculated by dividing Normalized Power by Average Power. It’s not necessarily about advocating high cadence, but we recommend that you adopt greater consideration about how you race. Use your gear range to keep your cadence consistent and practice trying to achieve a more steady, smooth power output during training sessions. Reference adapted from: training and racing with power meter Second edition Hunter Alan and Andrew Coggan. KempFitness was invited to take part in a research study. Study title: A physiological profile of recovery from resistance, endurance and mixed exercise types. Research investigating the usefulness of a variety of recovery strategies applied in both short-term and long-term settings has shown mixed results. It has been suggested that the type of exercise is a key factor in determining whether a recovery strategy will be beneficial or detrimental for short-term recovery or long-term training adaptation. Therefore the aim of this study is to provide a physiological profile of recovery from different types of exercise. The information gained will help in the understanding of how recovery from different exercise types may differ. Based upon these findings, it may be possible to match certain recovery strategies to post-exercise recovery goals, enabling a more informed selection of recovery strategies to enhance both short-term recovery and long-term training adaptation. The study will be divided into a control and an exercise week, whereby you will be required to visit the state of the art GSK Human Performance Lab on five consecutive days twice to conduct a variety of assessments. The study has received full ethical clearance from the Research ethics committee who reviewed the study. The committee is the Middlesex University, School of Science and Technology, London Sport Institute Ethics sub-committee. Additionally, the study has been internally reviewed by the GlaxoSmithKline Medical Governance Review Board. The results of the research study will be used as part of a Postgraduate dissertation. The results may also be presented at conferences, in journal articles, or through GSK Human Performance Lab Expert communications (www.gskhpl.com). However, the data will only be used by members of the research team and at no point will your personal information or data be revealed. Following publication of the results, on request, we will be able to provide a summary of the study results, although we will only be able to provide group data. All information you provide will be treated in accordance with the UK Data Protection Act. 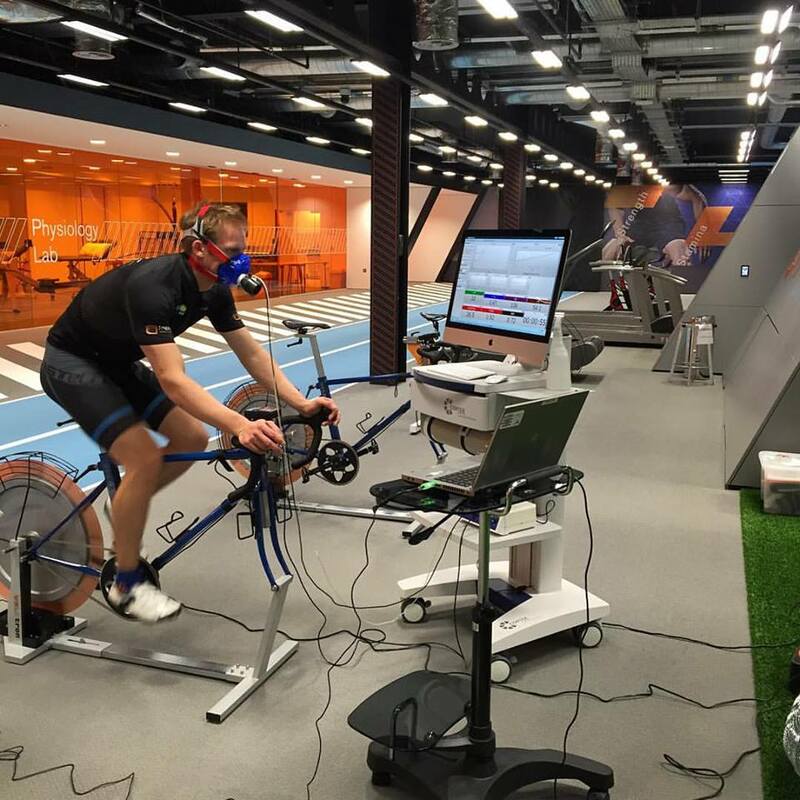 The VO2max assessment. The test will start at a power output of 200-250 W and will be subsequently increased by 4 W every 10 seconds (24 W per minute) until you cannot continue to cycle at the required power output. Blood sample. This will be taken by a trained phlebotomist using standardised procedures. Samples will then be processed and stored at -80 degrees at the GSK Human Performance Lab until further analysis. Subsequent analysis will take place at the GSK Human Performance Lab and samples will be analysed for markers of inflammation, muscle cell disruption, oxidative stress, muscle damage, collagen remodelling, and cell repair. Additionally, two samples will be sent to the University of Ulster to be analysed for markers of oxidative stress. Perceived recovery by completing a questionnaire; indicate your perceived muscle soreness on a visual scale. and jump as high as possible, using your own choice of depth and pace, whilst maintaining your hands on hips, on a force platform three times with one minutes rest between each effort to assess your rate of force development and countermovement jump performance. Fully bend and straighten your leg three times to assess your range of motion. Maximally kick your leg three times against a fixed lever arm with one minutes rest between each effort to assess the muscle strength of your leg muscles. You will be instructed to maintain your normal diet during the control week (other than abstaining from alcohol and caffeine) and will be provided with a diet diary to record this, before being asked to replicate this diet during the exercise week that follows. I was administered with an actigraphy wrist-watch which will be used to record various parameters of sleep and activity and will be worn continuously from visits 3-7 and 8-12. Why Choose a British Cycling Level 3 Coach? The British Cycling Level 3 coaching qualification is the highest recognised coaching certification in cycling, allowing coaches, who have the practical skills, experience and knowledge of cycling, to plan, deliver and evaluate detailed periodised training programmes for individual riders within a specific discipline. If you follow an off-the-shelf training plan, there is a possibility that you won't get fitter, and will not benefit from a structured plan which takes into account harder weeks and recovery weeks (periodisation) therefore ending up on race day either under trained or worse over trained. Training with a coach will save you precious time. The time consuming work of planning will be taken care of for you. Your schedule will be emailed over to you via Training Peaks. Your free time can be spent training, resting and improving! It is difficult to make objective decisions about training and racing, not least because such decisions are often emotional as well as physical. A coach will help you focus on your priorities and give you honest feedback on your choices even when it may not be what you want to hear. Having a bespoke training programme will help motivate you and keep you focused on your goals knowing your coach will be giving you feedback after sessions. A coach will include technical, tactical, and psychological training in to your programme, not simply workouts designed to improve your physiology. Athletes often enjoy working on their strengths; a coach will ask you to work on your weaknesses. Getting started At the outset we’ll have a detailed discussion about your goals and sporting history building a profile of where you are now & where you need to be. Once the basics are understood I look at your target events and goals to determine which physical, psychological, technical and tactical requirements are needed, then use this information to start planning & building your bespoke program. Honesty here is the only way to ensure we are both on the same page from the beginning. Performance improvement is about working on the things you need to improve, not the things you’re already good at! Remember having a coach is not just about receiving a set of intervals to complete each week or training 100% all of the time. It’s about being part of a dynamic partnership, being realistic with goals, balancing training with recovery and understanding what needs to change, why and how. Once you’re up and running you’ll conduct some performance tests to allow me to set your training zones. I’ll create an Annual Training Plan “ATP” which will keep your training very focused on your target events and of course you will have short, medium and longer term goals to reach as training progresses to ensure your ready come race day. Unlike a static plan each weeks training is based upon your feedback, performance and general well being in the previous training block. During the build up to your events I work closely with you to build a strategy for the event so come the day you know exactly what you’re doing. As your coach I will support you 100% but as the athlete you must take ownership and responsibility for your training to ensure you reach your goals. Programs are designed around clients having access to either a power meter, and or a heart rate monitor. I offer bronze, silver & gold coaching packages to suit. For more details & fees and to discuss your goals, training aspirations in more detail please contact me so we can arrange a Skype/phone chat with no obligation.